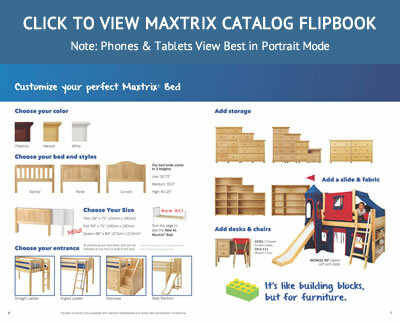 Maxtrix Bunk Beds with a ladder are made of solid wood and can separate into two beds. Bunks are available with a space saving straight ladder (pictured) or with an easier to climb angled ladder with handrail. The Low Height Bunk with straight ladder is on display in our Long Island Showroom which is located just a few blocks from the Roosevelt Field Mall and next to Pier 1. The Ladder (or Side Stairs) can be set up on the left or right. All Bunk Beds can separate into two stand alone beds. 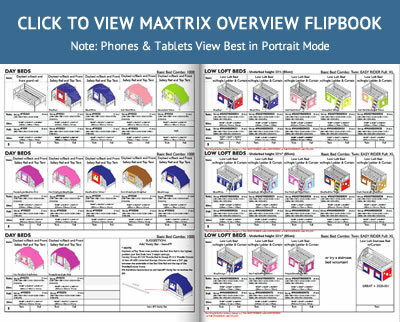 The Maxtrix Mattress Support System is rated to hold 400 lbs per sleeping surface. Curved, Panel or Slatted - If choosing the Curved style, add $50 for space reducing safety panels needed to go between the upper and lower bed ends. The measurements listed above do NOT include the Ladder or Stairs. The Side Stairs add 20" to the width of the bed. 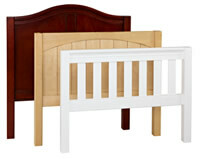 The Angled Ladder adds 32" to the depth of the bed. The Straight Ladder adds 4" to the depth of the bed. We will not be undersold by any store or website. If you see this item for a lower price, please tell us, and we will match it.